Creed C. Cook, 46. of Shady Spring, died at 11:30 p.m. Thursday in a local hospital after suffering an apparent heart attack. 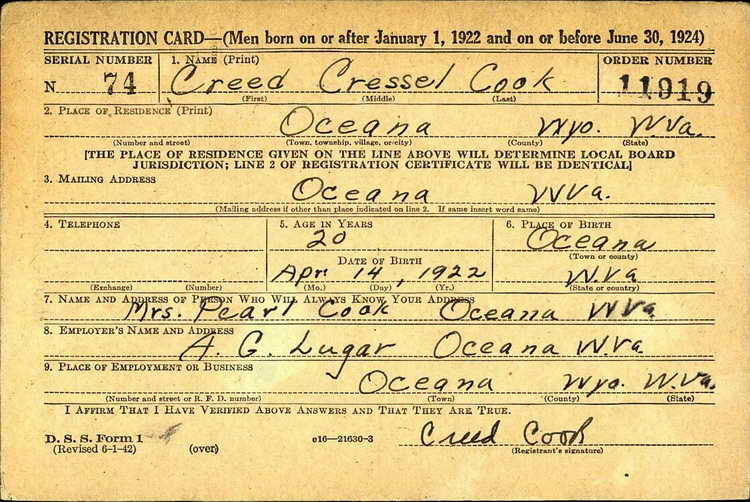 Born April 14, 1932 in Logan County, he was a son of the late Grant Cook and Pearl Barber . Cook was a veteran of World War II having served with the paratroopers and a member of the 82nd Airborne Association. He was employed as general night foreman of New River No. 2 mine at Stanaford [WV]. Funeral services will be conducted at 2:30 p.m. Sunday in the Rose and Quesenberry Peace Chapel with the Rev. A. Garten in charge. Burial will follow in Blue Ridge Memorial Gardens. Pallbearers will be Robert Thomas, Bill Richmond, Jerry Harris, Jack and Frank Rakes and Louie Adamos. Friends may call at the funeral home after 3 p.m. Saturday. [The Raleigh Register, Beckley, WV, 14 Mar 1969, Fri, Page 2] Creed C. Cook registered for the draft ca. 1942 and was inducted on 12 March 1942 at Fort Thomas, Newport Kentucky. Pvt Cook was transferred to Company D, 508th PIR on 28 August 1943. In 1943, he took a furlough on 5 November 1943 and while home he married Donna Lee Neely in Raleigh, WV. On the 19th of November he was appoint to the grade of Pfc. On 4 January 1945, Pvt Cook was Injured In Action in Belgium and evacuated to a field hospital. Still hospitalized, he was transferred to the hospital's detachment of patients on 12 April 1945. On 26 May 1945 he was transferred back to Company D from the 6900th Reinforcement Depot . Creed's military decorations include the Bronze Service Arrowhead Device awarded for his participation in Normandy assault. He may have also seen combat in Holland and the Good Conduct Medal.